Society tends to believe that grief makes you sad. If only grief was this simple. If you have lost someone you love, you should be prepared for the reality that grief will drag you through a huge expanse of emotions – from the raw, debilitating, and shocking wound of your immediate loss to the long-term feelings of loneliness, isolation and longing for your loved one that never quite go away. You may also be caught off guard when your emotions change rapidly, intensifying and then retreating again, only to reemerge when you least expect them. Most grievers are vulnerable when exposed to all of these complex emotions. Not only are you confused by what you are going through, but others around you don’t understand either. All of these feelings may combine to make you feel as if you are losing your mind. It is important to know that you are not losing your mind – you are grieving. And at times it feels as if you are fighting for your very survival. The emotions you undergo during grief will possibly be the most painful and confusing experiences you will ever have. Grief can leave a path of destruction so wide and overwhelming that it feels as if you will never recover. However, by understanding the grief process and the emotional fallout that can occur, you can be better prepared to deal with your pain. These are just a few of the negative feelings you may experience. The actual scope of what is possible is almost endless. If these feelings are not acknowledged and eventually worked through, they can pull you down into the quicksand of grief, each one like a weight attached to your ankle. Many times we try to push these emotions aside because they are not “acceptable” ways of coping, and because others are uncomfortable around our emotions. But…regardless of what is expected of us grievers from society, these emotions are inescapable, and we cannot change or ignore our feelings about the loss of our loved one, all we can do is try to move through them. Don’t let society make you feel ashamed or guilty about what you are going through. While grief has universal aspects, it tends to be a very isolating and subjective experience. The truth is that the grief experience is quite personal. There is no right or wrong way to grieve. There are no emotions that are better or worse to feel. Each of us will deal with the loss of our loved one differently. But we can be prepared for the possibility that our grief will not look the way that either we or society expects. Grief is a process that cannot be hurried or brushed aside. These emotions must be felt and processed so that we can eventually move to a place in life where we are finally able to live with our loss. To a place where our pain becomes at least bearable. How Do I Process my Emotions? •Do not push your emotions aside. Your emotions are trying to help you heal your broken heart. Feel them. Listen to them. Let them help you to move forward and accept that your life will be different. You will be different. This is the sad and brutal truth of grief and loss. •As you work through your emotions, hang onto the love and the positive memories. Eventually it is the love you shared, and holding onto those memories, that will be the healing balm for your heart. Allow the negative emotions to move through you, but hang onto the positive memories and the love. •Healing your heart doesn’t mean that you will forget your loved one, or that the love you shared is over. This love is yours forever. Love cannot be lost. •Realize that a part of your heart will always be wounded. This is a non-negotiable part of grief. Even years later, decades later, you will always mourn the loss of your loved one. But you will discover that love and loss can walk side by side in your life, and that you can experience joy in life again. Finding this joy is something your loved one would want for you. Keep working through your emotions and you will eventually come across that joy again. 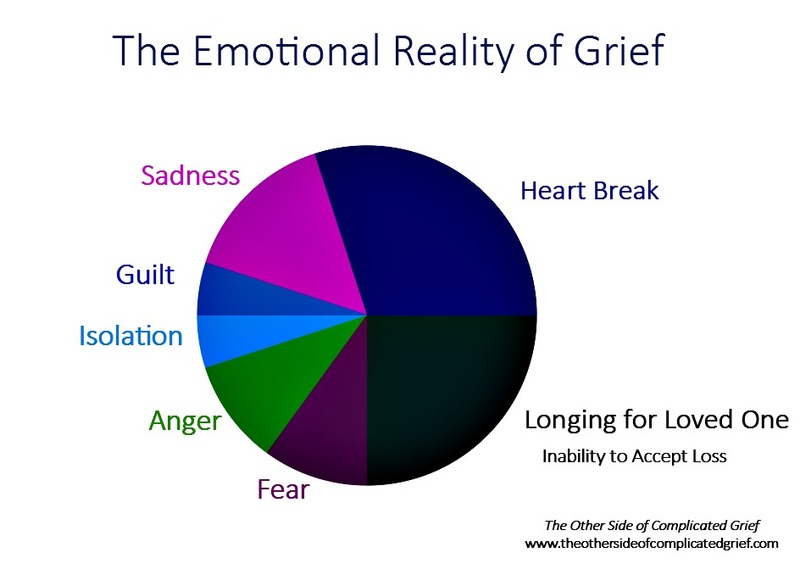 A very helpful post which explains the complex emotions and reactions associated with grief. Grief has seemed to be a prominent theme in my life and I’m just now managing how to deal with it. This is a wonderful post that I wish I’d found years ago.